We’d love your help. Let us know what’s wrong with this preview of The Eyes that drowned Uyuni by Prashant Chopra. "I started taking smaller steps; steps to match hers. Perhaps trying to slow time down, and ease things on her tiny feet that were on this Earth somewhere, now getting tired trying to get home." Her cheeks were salty. I could tell she had been crying, and letting the tears dry. Why? And for how long? I did not care. The same cheek she would not let her daddy touch before - with the 'I don't like your beard' excuse - was now getting soaked in my smooches. "Let's go home, sweetheart", I whispered. But she did not move. Her eyes were locked somewhere far on the plains. "What's wrong, baby? Let's go home. It's daddy..."
"I can't... I am sorry.". She kissed my forehead, freed herself from my grip, and started to walk away. "No. Not again. I cannot. How can I let you walk away?" After all this, after all the pains, fights, bruises, crusades - how can I just let you walk away? But she kept walking - her shadow was slowly becoming one with her self. Should I really set her free, and free myself too of the fear - the fear of missing her, forever? Is that what my love for her is leaving with? To ask other readers questions about The Eyes that drowned Uyuni, please sign up. The Eyes that Drowned Uyuni is a short and captivating read. The narration beautifully swings between the present and past of Parag, of how he lost his beloved wife Mriga and how he had won her. The author, Prashant Chopra, brought out the intimacy between Parag and Mriga without getting into too much details. Something seems to be going on with Parag, he believes he has a huge back tattoo, or gashes on his back. When he looks in the mirror though nothing is there. 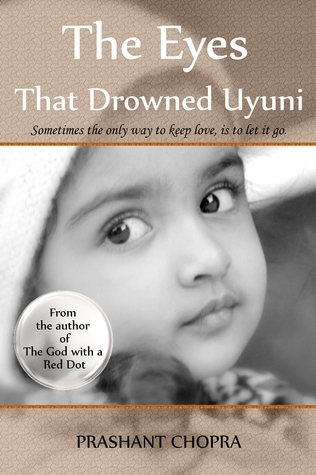 The daughter, Riyah, seems swe The Eyes that Drowned Uyuni is a short and captivating read. The narration beautifully swings between the present and past of Parag, of how he lost his beloved wife Mriga and how he had won her. The author, Prashant Chopra, brought out the intimacy between Parag and Mriga without getting into too much details. Something seems to be going on with Parag, he believes he has a huge back tattoo, or gashes on his back. When he looks in the mirror though nothing is there. The daughter, Riyah, seems sweet and innocent, why would a mother want to leave her? I totally agree with the following quote: "The same gentry that couldn't stop being royally cordial moments ago (using words like sorry, thank you, my bad....) was now scrambling to poach every inch of aisle space available (apparently everyone was in a dire hurry to get off the plane)." This is how all my plane rides end, everyone pushing to get to the front of the line, which I hate, because the doors aren't even opened as of yet! The Eyes that Drowned Uyuni feels unfinished, like an early draft. There is no character building like other novels / novella's I have read. You are thrown into a story, without character history. We do not know what city we are in, where are we in the world? Chapter 19 ends, and then Chapter 20 begins, however, we are further back in Parag's past? A smother transition needs to take place, such as: in 1985, I sat in my 10th grade year at ............ school. Or, re arrange the paragraphs where it feels smother, as it does a few paragraphs down from the beginning of Chapter 20. Thank you for the chance to read your novella. Truly enjoyed reading this book. Looking forward to reading its sequel. "It is December 12 today. The day I burned her lips, and won her heart. I want to be with her tonight. This is a beautiful novella, poetic and passionate. The story is lush, tragic and moving; the characters haunting and richly described. Unfortunately it suffers from a huge lack of editing. Confused verbs and adjectives, typos, ambiguous phrasing... Because of it's many language errors, The Eyes that Drowned Uyuni feels unfinished, like an early draft. Chopra's book needs the polishing of a good editor to really shine. Disclaimer - this was a Goodreads giveaway. The Eyes may have drowned Uyuni, but Chopra's words drowned me. It seemed like he picked every word and even every space with such care, it was a form of poetry. I will definitely be doing a re-read - I feel that many nuances can be picked up by a multiple read. A poetic story of extreme love, and its consequences. Has an almost Tarantino-esque plot switching style, which is technically difficult to execute, but done well here. Prashant Chopra works as an engineer during daytime, while his dreams to overhaul the world keep him busy at night.